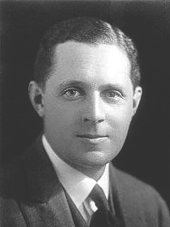 The composer, conductor and theatre administrator (Edward) Geoffrey Toye was an early volunteer for military service in 1914. The son of a housemaster at Winchester College, he was a talented pianist and following school at Winchester went up to the Royal College of Music. Details about his time at the College are obscure, although he was evidently excelling as a musician. The first composition gaining public notice was incidental music for a 'pastoral masque' called The Well in the Wood by C. M. A. Peake, which he co-composed with his elder brother Francis Toye, who was also a talented composer and musician (and who also later served in WW1). a new mime play in one act, called The Fairy Cap written by E. Geoffrey Toye, a scholar of the college. The story has a pretty fantastic basis, dealing with the loss of a fairy cap, and the fairy's attempts at recovery from a shepherd boy, who demands a kiss in payment. The fairy calls in the assistance of "Sun" and "Wind" and eventually gets back her property. The London Daily Telegraph said "this fancifully conceived trifle Mr. Toye has written music that is always apt, expressive, and refined and filled in with many happy touches a score that lacks nothing of suitable grace and delicacy." In the 1910s, he appears to have concentrated mainly on conducting, gaining roles conducting in the theatre. He became sufficiently well-known that he was asked to conduct the premiere performance of Ralph Vaughan Williams' London Symphony at the Queen's Hall London on 27 March 1914. After war was declared, the score of RVW's work went missing in Germany and Toye, and a number of Vaughan Williams' friends, including George Butterworth, possibly William Denis Browne and Edward Dent worked to reconstruct the full score of the work from the performing parts. Geoffrey was an early enlister, and is noted in the November 1914 edition of the Musical Times as a private in the Duke of Cornwall’s Light Infantry, the same regiment George Butterworth joined at the outbreak of war. Detail on his war service is patchy. At some point in the war Toye transferred from the Infantry to the Royal Flying Corps to work in reconnaissance and became a specialist in aerial photography. By the end of the war, he held the rank of Major. After the war, presumably to pay the bills, he became a marine insurance underwriter at Lloyds of London, but continued his musical career on the side, concentrating mainly on conducting. As an administrator and director, Toye is perhaps best known for his association with the D'Oyly-Carte Opera Company, where he revived Gilbert & Sullivan's mock horror operetta Ruddigore, composing a new overture and tweaking the score of the work in 1921, bringing new life to a work that had formerly been seen as one of the less-successful Gilbert & Sullivan works. He also published several choral songs during the 1920s, mostly for baritone solo and chorus including arrangements of "Auld Lang Syne", "The Keeper", "Can't you dance the Polka? ", "Lowlands", "Drunken Sailor" and three other Sea Chanties (Amsterdam, Missouri and The Liverpool girls). 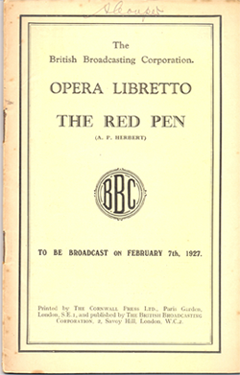 His first original composition to receive a wide audience post-war was his operetta The Red Pen of 1925, written for radio and broadcast on the fledgling BBC 2LO. Described by the composer as a "sort-of opera", its libretto by the humourist A.P. Herbert (1890-1971) is a satire on the trade union movement, with the premise that a union of writers persuades the government to nationalise their industry and create a "Ministry for Verse". It was performed again on radio in 1927 with a slightly different cast. Having left his insurance role, he took on important positions at Sadler's Wells and the Royal Opera at Covent Garden, where he appears to have had a significant disagreement with Sir Thomas Beecham over a singer which led to Geoffrey's resignation. Geoffrey also completed two ballet scores for Saddler's Wells; Douanes (1932), a short ballet about customs officials, and The Haunted Ballroom (1934), in which an ancient curse dooms successive generations of a family to dance themselves to death in their family ballroom. Gloomy as it sounds, the work is upbeat and nostalgic in tone, the ethereal waltz being Toye's most famous work, available on a number of light music CDs, often in a re-arranged form as 'Concert Waltz from The Haunted Ballroom'. During this period he also tried his hand at composing film music, with scores for the Alexander Korda films Men are Not Gods and Rembrandt, both in 1936. and produced the first G&S production for the cinema in 1939 with The Mikado, the first of a planned series that never happened, perhaps as a result of the outbreak of World War II. During World War II he worked for the BBC in a non-musical role. He died, presumably unexpectedly, in 1942 at the age of 53. I have been unable to ascertain whether this was through illness or as a result of the War. In terms of his legacy, regrettably many of Geoffrey Toye's more significant works appear to be lost. Raymond J. Walker noted in 2000 that the full score of The Red Pen was missing, with only the band parts and libretto available. Philip Scowcroft's Garland website also mentions a masque called Day and Night of which no trace can be found. Similarly, there is some confusion over whether Toye wrote a symphony - his entry in the Concise Oxford Dictionary of Music implies this, as does his entry in Minor Ballet Composers (page 88), this biography by David Stone and his Wikipedia entry, which probably comes from one of these sources. Does it still exist if it ever did?